Ice Blue Climbing Rope Dog Leash with orange tracer, custom rope connections and marine grade 316 stainless steel clip. 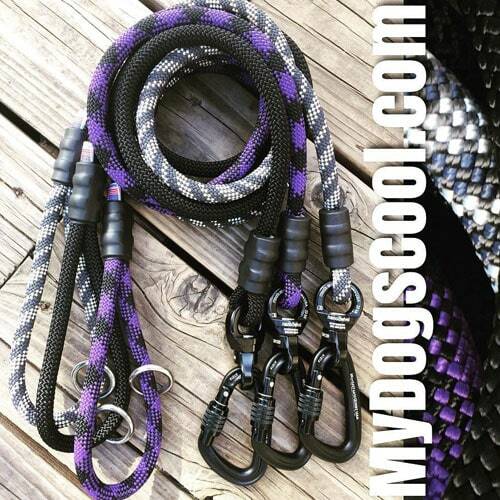 Our 4ft climbing rope dog leash is a favorite length for casual, and regular dog walks. Intended for medium to extra large dogs, this leash is built with some of the best materials. 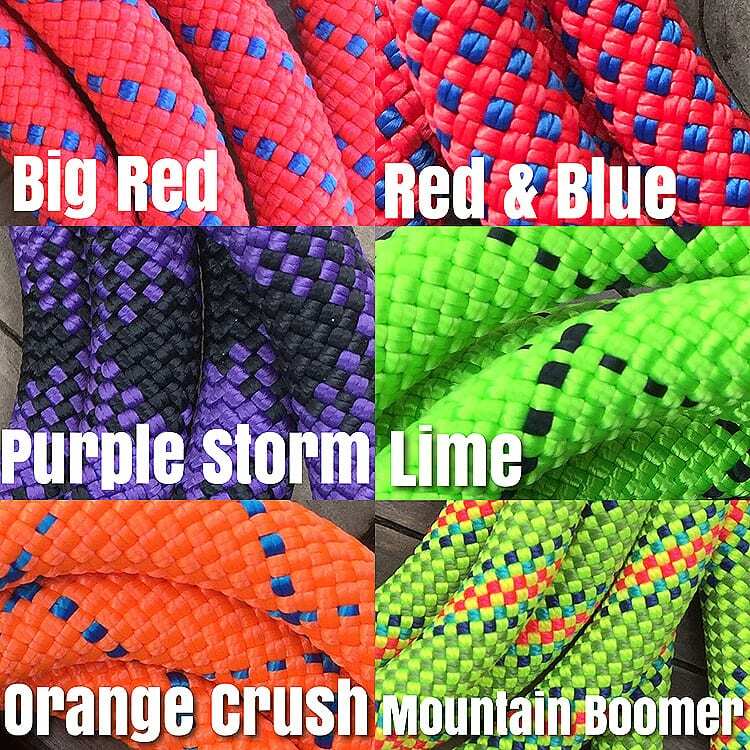 The 11mm climbing rope is among the best USA made rope. In fact all the rope we use is made in USA. The rope is UV resistant insuring the colors will stay bright, and vivid for years to come. 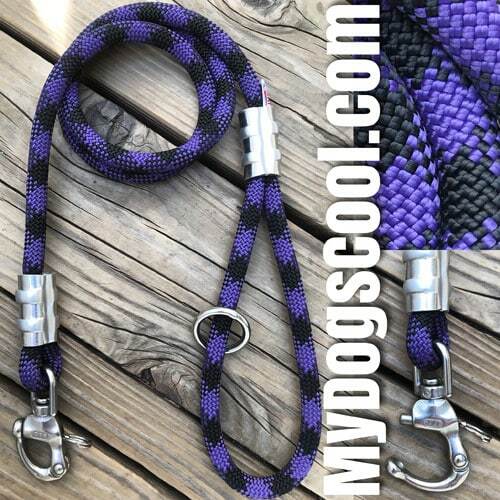 Abrasion resistant, strong, and comfortable to hold making this your go to leash for walking or training your big dog. 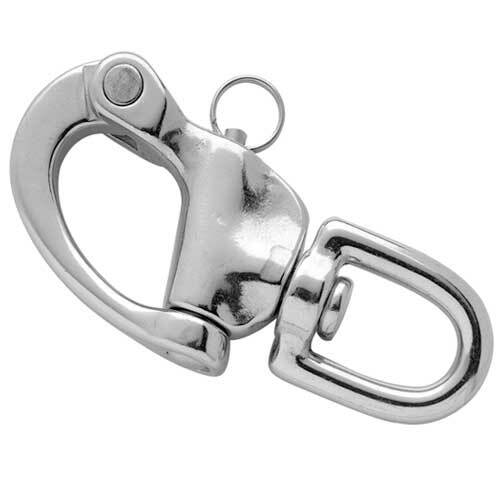 Our choice of marine grade 316 stainless steel clips are the same type used by professional divers, and used in the sailing industry. 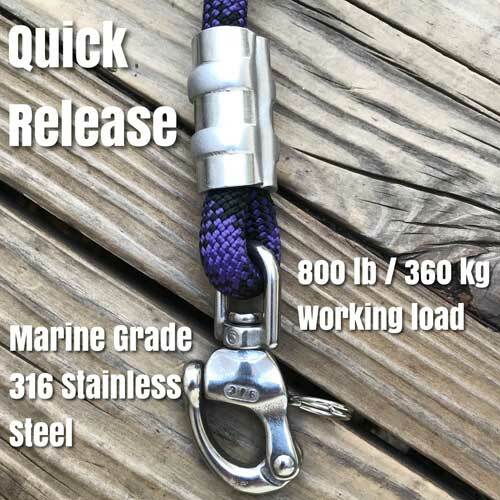 These are a traditional clip design except that they are stronger, and corrosion resistant making these a good choice for anyone walking their dogs on the beach. Rinsing in freshwater is still a good idea. Don’t confuse these quality stainless steel clips with the inexpensive clips used on most dog leashes. 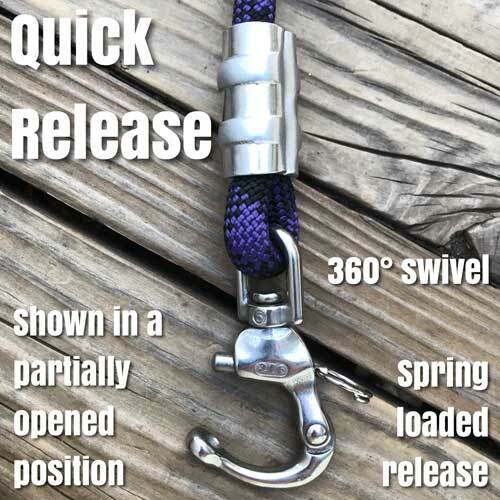 For those of us wanting the added strength, and safety of a carabiner dog leash, we offer this in the option menus below. 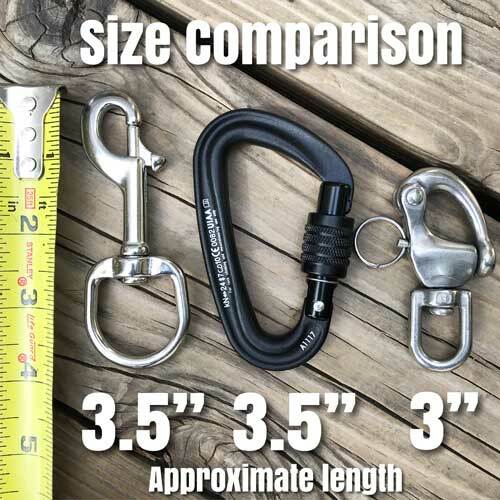 Keep in mind that carabiners by them self will not swivel like the stainless steel clips. The carabiners we use are CE rated forged aluminium compact carabiners designed for climbing, and lightweight enough to use for dog leashes. 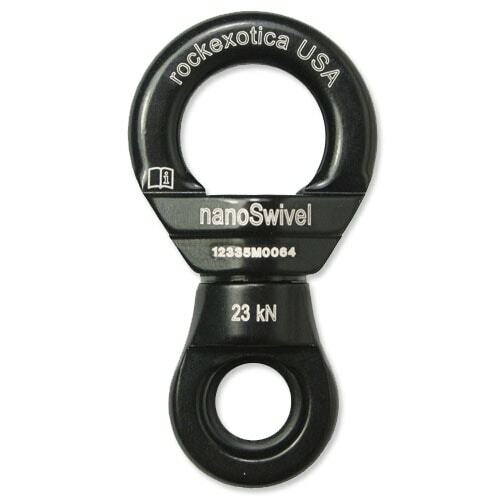 These are approximately the same length as the stainless steel clips, but offer greater strength, and safety. For even greater strength, our Ultimate Dog Leash for your extra large dog may be ideal. The Ice Blue Climbing Rope Dog Leash is available in longer lengths for basic obedience training or shorter control leashes. See option in the drop down menus below. 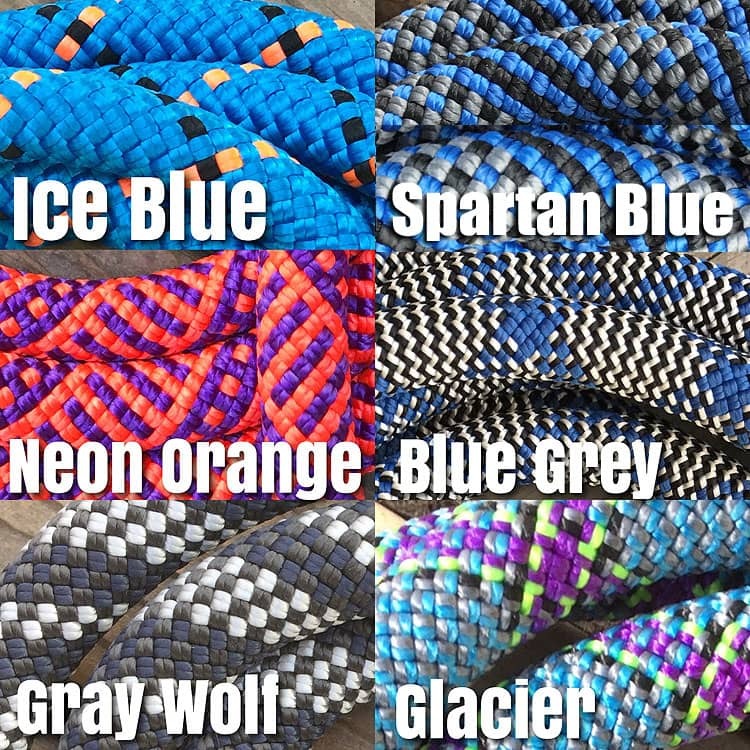 As always, these custom climbing rope dog leashes are handmade in the USA. As a military Vet I’ve had the opportunity to do a lot of things. One of those things is often not given much thought, and that’s the opportunity to work with quality gear. In the civilian world something as simple as a quality dog leash was difficult to find. Having experienced dogs breaking leashes I’m familiar with that gut wrenching feeling seeing a dog take chase into the mountains with no familiarity of the terrain or the understanding that he could soon be the one chased. With the motivation I needed, several dog leash designs were built out of a garage with old rope, and spare parts. A simple design was settled on. That was it, me and my dog were good to go on our next adventure! In the coming years people would always ask where I got my cool dog leash. MyDogsCool.com soon followed. We’re thankful to our customer, and enjoy knowing that so many people are doing their best to provided their dogs with a better than average dog leash. A dogs leash is its life line between you and harms way. We appreciate your business. Thank you!